It’s happened to all of us. You’ve come home after a long day, only to realize that you either forgot to take something out for dinner, or the dinner you had originally planned to make will take too long to prepare. We’ve all been there, right. Quick,easy and affordable one-pot meals are the perfect solution to this dilemma. My local ShopRite Supermarket now carries the new Barilla® Pronto™ Penne pasta. Have you heard of it? I tried it recently and loved how easy it was to create a delicious meal in under 30 minutes. This delicious One-Pot Zesty Pasta Primavera made with the new Barilla® Pronto™ Penne pasta was made using only one pot – YES, you read that correctly! Life gets pretty hectic here on the farm. My husband works long hours, so I like to find quick, budget-friendly and hearty meals to prepare for the family. I also love the fact that with Barilla® Pronto™, there is only one pot to wash. Less pots to wash equates to more family time together and less time in the kitchen washing dishes. Who likes to wash dishes anyway! I love to make a pasta primavera for my family. It’s a way that I can get them to eat their vegetables. Pasta primavera is so versatile too. You can really make it with any combination of vegetables that you like; making it a great dish for seasonal produce. I also choose to add a little kick to this version (that’s where the zesty comes from in the title) by adding red pepper flakes. Here’s how I whipped up this One-Pot Zesty Pasta Primavera. I began by chopping my vegetables and sautéing them in a large skillet for about 3 minutes. Once the vegetables are finished, remove them from the skillet and place in a bowl. Now this is the cool part. In the same skillet, add the entire box of Barilla® Pronto™ along with 3 cups of water. Bring the pasta to a boil and cook for ten minutes until the liquid is absorbed. That’s right, no big pot of boiling water. The pasta is prepared in the same pot as the vegetables. Sweet! Now, add the vegetables back to the pot with the pasta as soon as all the water is absorbed. Pour in the chicken broth and light cream and bring to a simmer. The liquid will thicken after a few minutes. Stir in the parmesan cheese and chopped basil at the end. Pasta makes me happy and this One-Pot Zesty Pasta Primavera made my whole family happy. It had the right amount of vegetables, the right amount of sauce and the right amount of spicy zest! But the best part of this whole recipe – it was made in only one pot! Hooray for Barilla® Pronto™. Thank you for making dinner easy and quick! Be sure to stop by your local ShopRite and grab a few boxes of the Barilla® Pronto™. It comes in several different varieties which include Penne, Spaghetti, Rotini, Elbows and Linguine. While you are there, be sure to take advantage of ShopRite’s In Store Offer (No Coupon Needed): Buy any FOUR (4) Barilla® Pronto™ pasta products for $5.00 or $1.25 each available until 5/16/15 while supplies last. Wash and prepare fresh vegetables. Heat a large skillet (12") on medium-high heat. Add 2 tablespoons of olive oil and red pepper flakes. Add vegetables and garlic to heated skillet and sauté for 3 minutes. Season with salt to taste. Remove vegetables after three minutes and set aside. To the same pot, add one box of Barilla® Pronto™ Penne. Add three cups of cold water to skillet. Turn burner on high and bring to boil. Add pinch of salt if desired. Set timer for 10 minutes and stir pasta occasionally. After 10 minutes, add the sautéed vegetables back into the skillet. Reduce heat to medium. Pour chicken broth and light cream over mixture. Stir to incorporate. Add grated parmesan cheese and mix together. Bring to a simmer and cook until sauce thickens. Add basil right before serving. Enjoy! Let me know how you like it. I am ALL about the one pot meals, who has time for a ton of dishes?! This looks like a great one to try. This is a one pot wonder!!! Love those zippy red pepper flakes and that quick cooking penne Melissa. And those FARM FRESH VEGGIES!!! Quick and easy, that’s what we like around here! Mmmm!!! 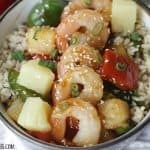 Love an easy weeknight meal, this looks delish! I love Pasta primavera! For me this pasta dish should be eaten the whole year through and not just during spring! Your dish looks so deliciously good! That looks amazing. Primavera is a favorite. Love that it is one pot. One pot meals are great! It makes for a happy husband when he has so many less dishes to wash! haha.